Seeking peace and safety after a hard childhood, Leah marries Judah, a strong and gentle man, and for the first time in her life Leah believes she can rest easily. But the land is ruled by Antiochus IV, descended from one of Alexander the Great's generals, and when he issues a decree that all Jews are to conform to Syrian laws upon pain of death, devout Jews risk everything to follow the law of Moses. 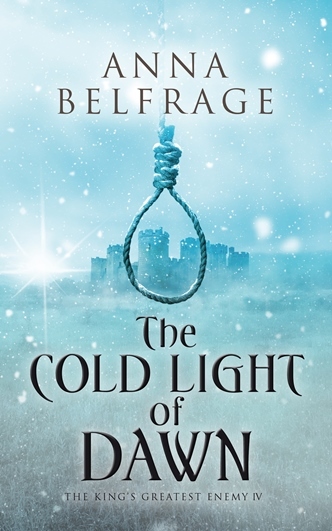 Judah's father resists the decree, igniting a war that will cost him his life. But before dying, he commands his son to pick up his sword and continue the fight--or bear responsibility for the obliteration of the land of Judah. Leah, who wants nothing but peace, struggles with her husband's decision--what kind of God would destroy the peace she has sought for so long? The miraculous story of the courageous Maccabees is told through the eyes of Judah's wife, who learns that love requires courage . . . and sacrifice. 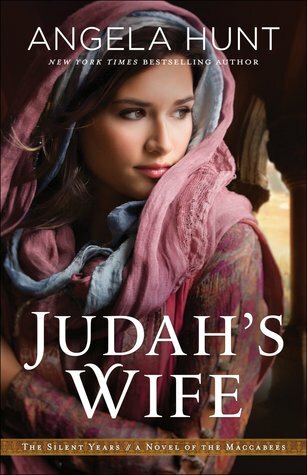 Told with alternating points of view, Judah's Wife is a story of the silent years between the Old and New Testaments, Malachi and Matthew. The Maccabees is a name I have heard of but know nothing about and that's what I love about reading historical fiction - digging into the past in an informative and entertaining manner. Discovering a new author along the way is also great. Angela Hunt has written an emotional story about a young woman named Leah. Growing up in an abusive home she longs for peace and in her marriage she might just have found that. But it's short lived, bringing back memories and fears for the future. Judah wants nothing more than to please his wife but his father's dying wish takes him in a different direction. Getting a view from both Leah and Judah gave me a real sense of the times and what the Jews endured. Judah's Wife is well researched, it's a book about forgiveness, courage and devotion. Fans of Bibical fiction will enjoy this one. Book has been provided courtesy of Baker Publishing Group and Graf-Martin Communications Inc. Fiery aristocrat, Eden Rose, uprooted from her native Scotland, has tended a foundering marriage and failing ranch at the corner of Crazy Woman Creek and the Powder River for a decade. Best friend, backwoods spitfire Maddie True, has her own woes a few miles away: widowed with a passel of young children, and caretaker to her addled father. Abandoned by her husband during the height of Wyoming Territory’s worst drought in history, Eden depends on her inept brother, Aiden, to see her through the coming winter. But when he disappears into the wild Bighorn mountains, she shuns Maddie’s fearful cautions, teaming with enigmatic Lakota holy man, Intah, to find her brother before the wicked snow holds them all hostage. Light of the Northern Dancers is optioned and currently in development for a limited television series. Robin F. Gainey partnered in creating California’s Gainey Vineyard; presided over their culinary programs; and, with Julia Child, founded Santa Barbara’s American Institute of Wine and Food. She also oversaw the breeding and showing of champion Arabian Horses begun by the Gainey Family in 1939. She’s lived in California, Colorado, Washington, and Rome, Italy. She returned to her hometown, Seattle, to find her heart in writing. Active trustee of the acclaimed, Pacific Northwest Ballet, she enjoys reading, cooking, horseback riding, skiing any mountain, and spending three months every year cruising the wild Canadian Inside Passage aboard her boat—mostly alone. Light of the Northern Dancers, her second novel, is optioned and in development for a limited TV series. For more information, please visit Robin F. Gainey's website. 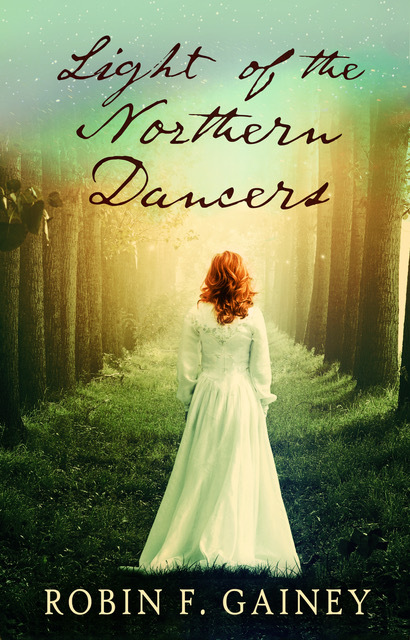 During the Blog Tour we will be giving away two eBooks of Light of the Northern Dancers by Robin F. Gainey! To enter, please enter via the Gleam form below. Giveaway Rules – Giveaway ends at 11:59pm EST on April 20th. You must be 18 or older to enter. – Giveaway is open to US residents only. – Only one entry per household. – All giveaway entrants agree to be honest and not cheat the systems; any suspect of fraud is decided upon by blog/site owner and the sponsor, and entrants may be disqualified at our discretion. – Winner has 48 hours to claim prize or new winner is chosen. 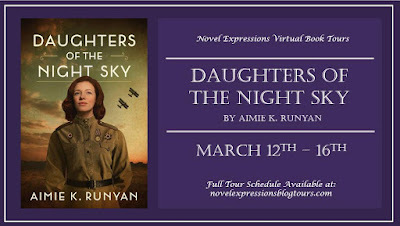 I am thrilled to have Aimie K. Runyan here at JustOneMoreChapter today. I've read all 3 of her books and look forward to many more. Be sure to scroll down to the bottom for links to her social media sites and links to my reviews. Aimie, I am going to regress a little here and go back to your series, Daughters of New France. This Canadian is always on the lookout for HF taking place in Canada and any books I have found were usually written by a Canadian. You aren’t Canadian, what made you pick this story to write about? I am actually French-Canadian by ancestry on my dad’s side, and learned (after writing my Master’s thesis on these remarkable female pioneers) that I’m descended from more than a dozen filles du roi. Apparently blood won out! I first learned about these women when I was working on my MA in French at Indiana University. I was taking a course on Canadian Civ, and the professor spent perhaps a quarter of an hour discussing female emigration to New France. I was also taking a creative writing course for fun, and was immediately struck that these women deserved to be known. I wrote a short story from the POV of the character that would become Nicole, and a decade later, decided to finish the book! With Daughters of the Night Sky you take the big leap to Russia during World War 2, again what drove you in that direction? Practicality, in many respects. And persistent friends. I knew I needed to choose a marketable era (like WWII) for a few projects to gain the readership I’d need to have success selling books that take place in lesser-known times and places. Several friends sent me articles about the Night Witches when I was idea-hunting, and I was captivated by their bravery. Once I started writing the synopsis, it was a concept that wouldn’t let go. Did you get a chance to visit the areas you wrote about? Sadly, no. A trip to Russia wasn’t in the budget. I have been to Germany and France, which was helpful for the last few chapters. So how did you go about a getting a feel for that era. I *have* been to Alaska, which shares a lot with Russia in terms of climate and geography, so that was very useful for descriptions. I relied a lot on personal narratives from the Night Witches, and also had the chance to fly in an open-cockpit WWII-era biplane. That was the highlight of my research for sure! What is one thing you hope readers will take away from this story? Wars are not fought exclusively by men. There have been thousands of women in the last century who answered their countries’ calls for aid in their hour of need, and who did so without reservation. They gave their lives freely to protect their families and their freedoms. And while the men who fought were also heroes, not all can say they volunteered their service as freely as every single woman who took up arms for her country. 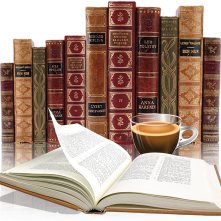 What can you readers look forward to in the future? I’ve just turned in Girls on the Line, which is a story of the American telephone operators who served in France during the Great War. This book was absolutely a love affair of mine, and I can’t wait for you all to read it in early November, just in time for the 100th anniversary of the armistice! Aimie when this interview posts you will be in the sunny south, care to share what books you are packing? Quite a few! I’m taking early review copies of Carousel Beach by Orly Konig, In Praise of Difficult Women by Karen Karbo, The Optimists Guide to Letting Go by Amy E. Reichert, and a whole Kindle-full of books I’ve been wanting to read for ages!!! Aimie K. Runyan writes to celebrate history’s unsung heroines. 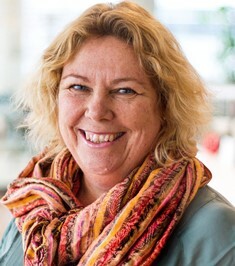 She is the author of two previous historical novels: Promised to the Crown and Duty to the Crown, and hard at work on novel #4. 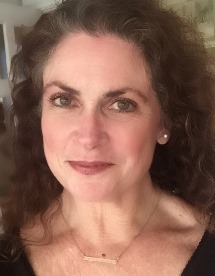 She is active as an educator and a speaker in the writing community and beyond. She lives in Colorado with her wonderful husband and two (usually) adorable children. While debate raged in England over whether Livingstone could be found—or rescued—from a place as daunting as Africa, James Gordon Bennett, Jr., the brash American newspaper tycoon, hatched a plan to capitalize on the world’s fascination with the missing legend. 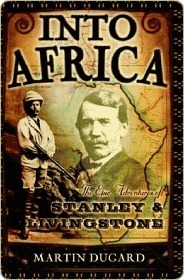 He would send a young journalist, Henry Morton Stanley, into Africa to search for Livingstone. A drifter with great ambition, but little success to show for it, Stanley undertook his assignment with gusto, filing reports that would one day captivate readers and dominate the front page of the New York Herald. Tracing the amazing journeys of Livingstone and Stanley in alternating chapters, author Martin Dugard captures with breathtaking immediacy the perils and challenges these men faced. Woven into the narrative, Dugard tells an equally compelling story of the remarkable transformation that occurred over the course of nine years, as Stanley rose in power and prominence and Livingstone found himself alone and in mortal danger. The first book to draw on modern research and to explore the combination of adventure, politics, and larger-than-life personalities involved, Into Africa is a riveting read. I’m always fascinated with explorers, those that go out into the world who are brave enough to risk so much in their search. Stanley and Livingston are names I heard all through school, famous explorer and famous statement 'Dr. Livingston I presume' has stayed with me and left me wondering about their stories. I went with the audio version, the reader was someone new (to me) so he did a fantastic job. The author doesn’t hold back as he describes this journey and the hostile environment Africa was during that time. This books isn’t just about finding Livingston but it gives the background information on both these men, the time period as well as what happens after their meeting. I grew up thinking Livingston was a missionary however this book doesn't really get into that aspect of his life but centered on his search for the source of the Nile. History classes had me assuming the search for Livingstone was straight forward but as shown here it was anything but. Disease was a daily concern, violence and desertion a common occurrence. The weather was scary and the bugs/insects even more so. How these 2 managed to meet up was amazing and it took years. There is a wealth of information here and I am glad to have gone the audio way this time around. Nonfiction leans itself well in that direction. My copy was from my personal library (via Audible). Objectively, Sophie is a success: she's got a coveted job at a top consulting firm, a Manhattan apartment, and a passport full of stamps. It isn't quite what she dreamed of when she was a teenager dog-earing pages in exotic travel guides, but it's secure. Then her best friend bails just hours after they arrive in Hong Kong for a girls' trip, and Sophie falls for Carson, a free spirited, globetrotting American artist. He begs her to join him on his haphazard journey, but she chooses responsibility and her five-year plan. Back in New York, that plan feels less and less appealing. As Sophie recalls the dreams she's suppressed, the brief international jaunts she sneaks in between business trips no longer feel like enough. Carson isn't ready to let her go either, but as they try to figure out their relationship, Sophie realizes she may have to pursue her passions with or without him. 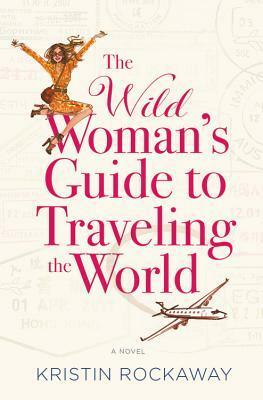 Sophie has it all, or so she thinks, she has her precious five-year plan that works with her career, a savings account and a job that allows her to travel the world. She doesn’t realize what she is missing until she gets a taste of it then the real adventure begins. This is the author’s debut and I hope she writes a sequel with more adventures of Sophie and Carson. I loved the historical details of both locations and while the ending was a little predictable it was still a great read. There are a couple risque scenes which might not appeal to all, but this is chick lit and easy to skip over. Thanks to TLC Tours for the opportunity to be part of this tour. 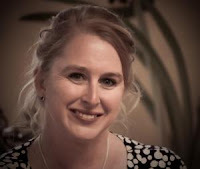 Find out more about Kristin at her website, and connect with her on Twitter, Facebook, Instagram, Pinterest, and Goodreads. When newly widowed Elsie is sent to see out her pregnancy at her late husband's crumbling country estate, The Bridge, what greets her is far from the life of wealth and privilege she was expecting . . . When Elsie married handsome young heir Rupert Bainbridge, she believed she was destined for a life of luxury. But with her husband dead just weeks after their marriage, her new servants resentful, and the local villagers actively hostile, Elsie has only her husband's awkward cousin for company. Or so she thinks. Inside her new home lies a locked door, beyond which is a painted wooden figure--a silent companion--that bears a striking resemblance to Elsie herself. The residents of The Bridge are terrified of the figure, but Elsie tries to shrug this off as simple superstition--that is, until she notices the figure's eyes following her. 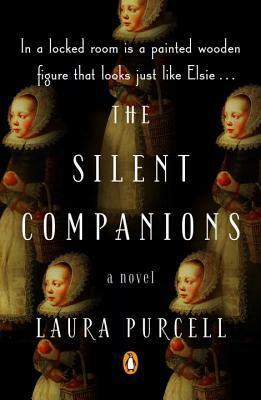 A Victorian ghost story that evokes a most unsettling kind of fear, this is a tale that creeps its way through the consciousness in ways you least expect--much like the silent companions themselves. I have been shying away from contemporary psychological thrillers these days, I find they lack the creepy, suspenseful, on the edge of your seat feel. 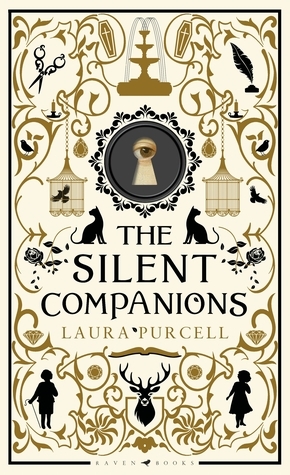 And to be totally honest I had given up hope of obtaining an arc (of The Silent Companion) from netgalley when I requested back in the fall. When I did receive this last week I jumped right in blind, totally forgetting what this book was about but being familiar with the author I knew I was in good hands. The Silent Companions is the type of eerie, suspenseful, spooky, mysterious book that I love, add the historical setting and I was glued to the pages. There are two time periods involved here, 1635 and 1865 that are connected by The Bridge, an estate that the locals stay away from because of its dark history. 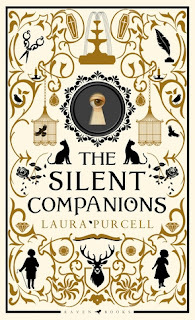 Laura Purcell does a great job setting the mood for this story, with it's locked doors, strange noises and equally interesting characters (real and wooden) and of course an old diary. Because of the time periods involved the mystically elements fit right in, witch's were believed to exist and the way everything was presented felt authentic. Definitely shows the authors knowledge of the time period. While I didn't get that scared feeling I was totally captivated here, I had to keep reading to find out what was going on. I like the cover above but think the UK version is also great. Thanks to the publisher (via Netgalley) for an advanced copy in exchange for honest review. A thirteenth century castle, Chateau de Doux Reves, has been forgotten for generations, left to ruin in a storybook forest nestled deep in France's picturesque Loire Valley. It survived a sacking in the French Revolution, was brought back to life and fashioned into a storybook chateau in the Gilded Age, and was eventually felled and deserted after a disastrous fire in the 1930s. As Ellie Carver sits by her grandmother's bedside, she hears stories of a castle . . . of lost love and a hidden chapel that played host to a secret fight in the World War II French resistance. But her grandmother is quickly slipping into the locked-down world of Alzheimer's, and Ellie must act fast if she wants to uncover the truth of her family's history. Sparked by the discovery of a long forgotten family heirloom, Ellie embarks on a journey to French wine country to uncover the mystery surrounding The Sleeping Beauty--the castle so named for Charles Perrault's beloved fairy tale--and unearth its secrets before they're finally silenced by time. Set in three different time periods--the French Revolution, World War II, and present day--The Lost Castle is a story of loves won and lost, of battles waged, and an enchanted castle that inspired the epic fairy tales time left behind. The Lost Castle is not your average dual time period book, because this book has three time periods. The Sleeping Beauty is a 13th century castle with many stories to tell. The Chateau de Doux Reves survives the French Revolution but not a fire in the 1930’s. Left abandoned the French resistance uses its shell to hide in. The current day story centers around Ellie and her quest to unravel the story behind a mysterious picture of her grandmother taken at the ruins. The synopsis above does a great job of descibing the stories here without me going into more detail. Suffice to say I really enjoyed this book. Each of the characters were unique, their journeys played out nicely and the landscape was easy to visualize. As each women searches for meaning in different ways they battle through war, whether physically or through another their lives are changed because of it. The Lost Castle is a story of love and loss, strength and determination. The author’s passion for this story was evident with vivid descriptive detail and an interesting story where all the pieces fit together nicely. 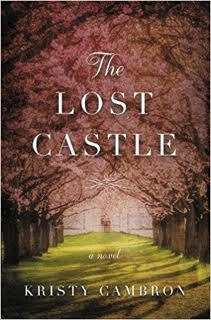 This looks to be the first book in a new series called The Lost Castles, a series I will continue to read. 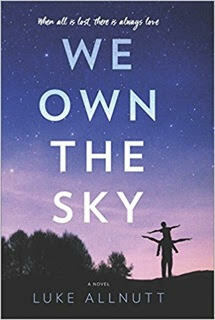 This is my second book by Kristy Cambron and my favorite so far. 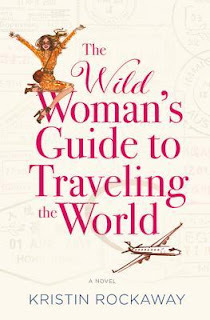 Thanks to TLC Tours and Netgalley for an advanced copy in exchange for my honest review.